UFO SIGHTINGS DAILY: Alien Structure On Pluto Found In New Horizons Photo, Jan 2016, Video, UFO Sighting News. 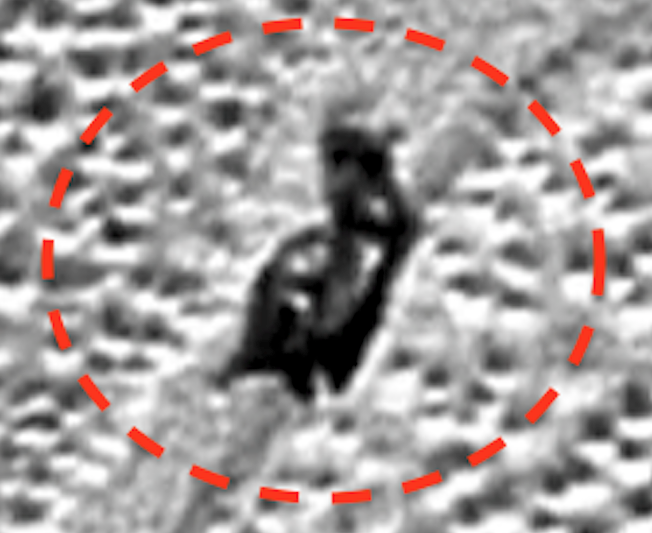 Alien Structure On Pluto Found In New Horizons Photo, Jan 2016, Video, UFO Sighting News. This building on Pluto stands out from its surroundings. I say building, because I have seen structures like this before on Earths moon and Mercury. This structure has an opening facing us. This building is unique to others I found in that there is a trail made from it moving back and forth along the surface of Pluto. Yes, I said it can move. The shininess of the black structure is due to a coating of ice over it. Its normal appearance is non-reflective black (stealth). These buildings always have a different shape. The seem to have been grown, rather than created. More biomechanics in style. Saves people time if people don't have to make them right? The best one I ever found was on Mercury. It had a the face of an African male about 30 years old and happy, round and the best detail I had ever seen. I could even see there were seams in it, much like the statue of liberty has in its face...lines were it was put together. That doesn't mean it was grown, but it was high detail. My Windows computer got a black screen virus the next day, destroying everything. I had to toss the computer out. So I had no evidence of it, but I still see his face in my head. Africans...are descended from the stars.